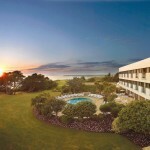 The Atlantic Hotel high above St. Ouens Bay in Jersey has an awful lot going for it. Not only is it, hands down, my favourite hotel on the island – it sits in a breathtaking position at the top of the cliffs – but its Ocean Restaurant has a culinary offering to rival anywhere else on Jersey. It is a remarkable achievement on a foodie island brimming with outstanding restaurants, Michelin and otherwise. 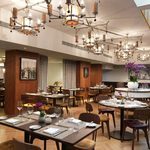 In a genius move, hotel owner Patrick Burke recruited the much-decorated Will Holland as Executive Chef following the restaurant’s almost legendary status under the previous stewardship of Mark Jordan. And, I’m pleased to report, under Holland the legend continues. 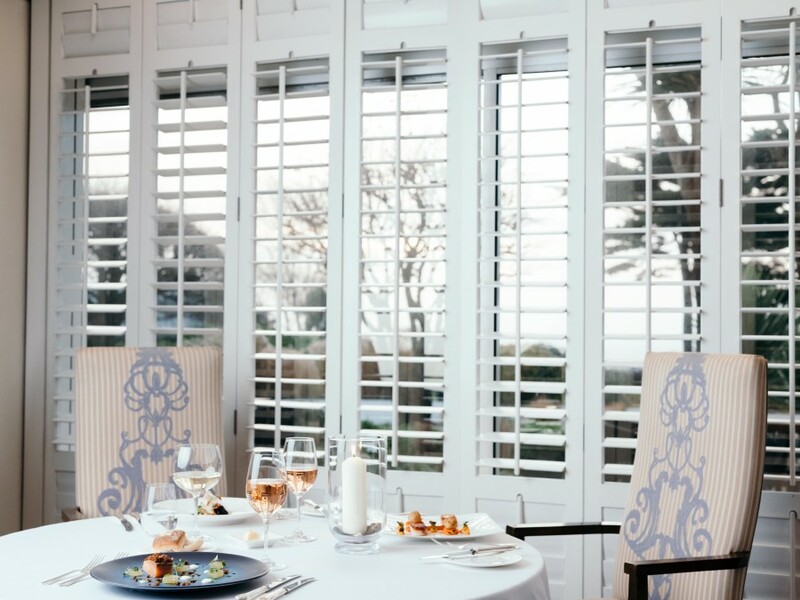 Ocean Restaurant is a beautiful room, decked out in coastal blues and whites with handsome wooden shutters framing that extraordinary Atlantic ocean view. An intimate Tasting Room is set aside for Holland’s seven-course tasting menu. It’s temptingly within touching distance but tonight I’m trying the Market Menu, a celebration of the pick of Jersey’s daily fresh produce. A test perhaps, of the island’s impressive food to fork potential. Food and Beverage Manager Jara, (“like the river in Melbourne?” I ask him. “Exactly, but nowhere near as wet” he replies) somehow manages to seamlessly guide me to a window table while at the same time whisking a chair back and preparing a napkin. This dining equivalent of spinning multiple plates is further enhanced by a touch of magic; a menu materialising from thin air. Jara may have one or two magical tricks up his sleeve to impress his guests, but it’s all part of Ocean’s glorious dining theatre. He may be the ringmaster, but he heads up a team of top-notch table professionals who deliver a well-oiled service. Having already decided on the Market Menu, I throw down the gauntlet and pick the matched wines too. 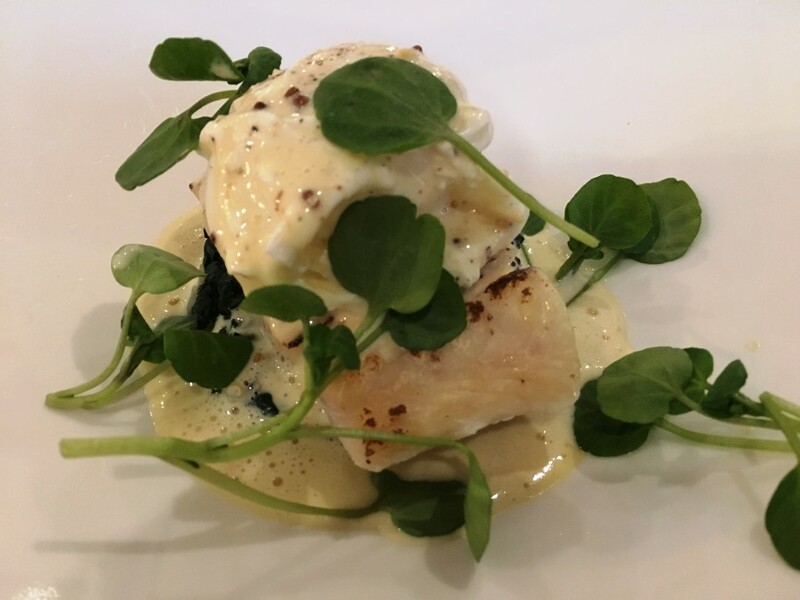 There are two choices on each course, and Mrs M goes for the smoked haddock with poached egg, spinach, crushed Jersey Royals and watercress. It’s matched with a crisp Austrian wine; Obere Steigen-Huber 2015 (£10 for 175 ml). 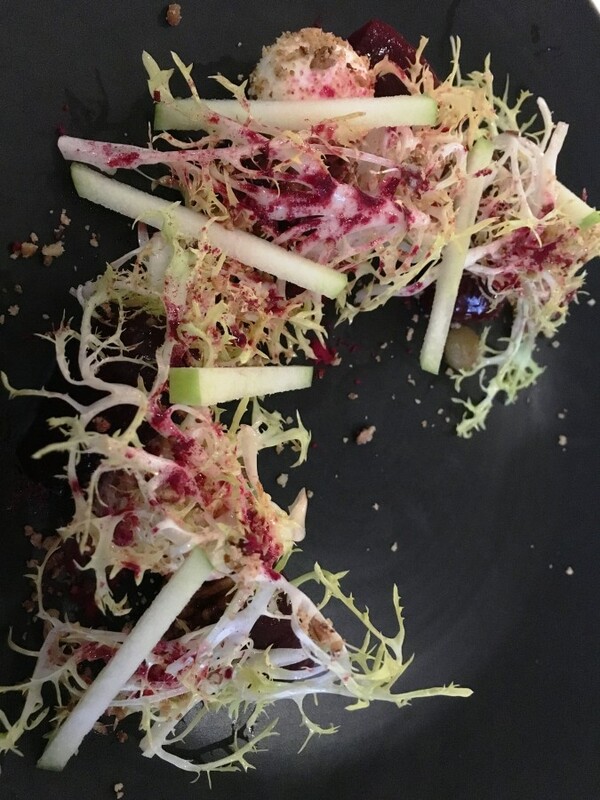 I, on the other hand, take a leap of faith choosing goats cheese mousse with salt-baked beetroot, apple batons and candied walnuts. I’m always wary of strong goats cheese, but this was a delight; the mousse blended perfectly with the beet and apple. The matching Pinot Noir Menetou-Salon 2014 (£10 for 175ml) isn’t too shabby either. Taking a look outside, I’m rewarded with a glorious sunset across the bay. This is such a magical spot. 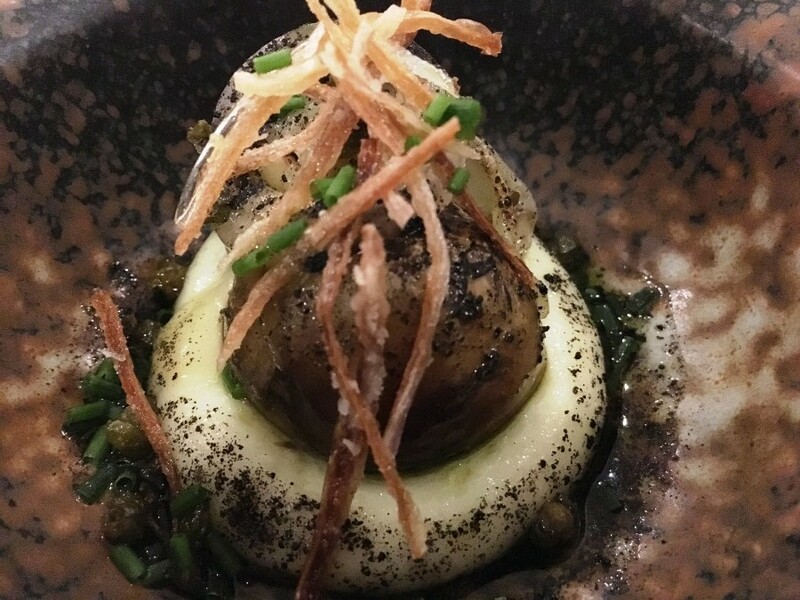 With two bulls-eye starters in the bag, an amuse-bouche swiftly materialises; an intriguing looking creation from sous chef Adam Braithwaite. A Jersey Royal on a bed of crushed Royals, with Comté, crispy shallots and capers. It is quite something for such a small and delicate morsel. I instantly fall head over heels in love. I want another but common sense prevails as our mains are proudly delivered. 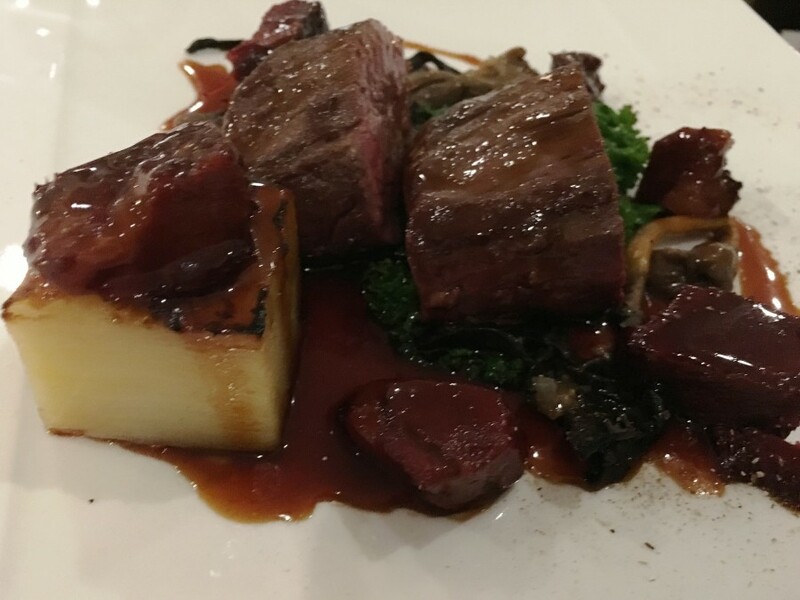 In a show of solidarity, we have both chosen the roasted Jersey beef fillet with braised ox cheek, dauphinoise potato and a wild mushroom fricassee. Another taste of magic as Jaro appears from nowhere with a couple of glasses of Aster-Crianza Tempranillo (£12.50 for 175ml). The fillet was succulently tender, the mushroom woody, the wine an excellent match. This is all going very well. My pining for another amuse-bouche still hasn’t dissipated. It really was that good. Mrs M gives me one of those looks and I suppress the urge. It seems there are plenty of familiar faces making repeat appearances tonight both hotel guests and locals and Jara’s magical skills are being severely tested. However, his plates continue to spin unabashed. 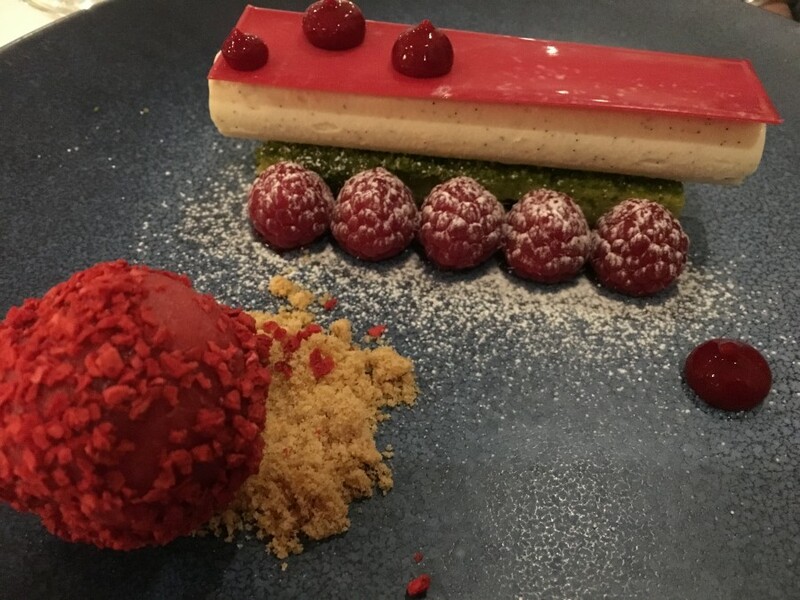 The dessert course beckons and despite a tempting cheese option, we both go for the lemongrass and vanilla ice cream with fresh raspberries, pistachio biscuit and raspberry sorbet. This is an absolute showstopper for me and I’ve fallen in love all over again. The lemon is sensationally tart, there are hints of basil in there too. It really is a magnificent finish. 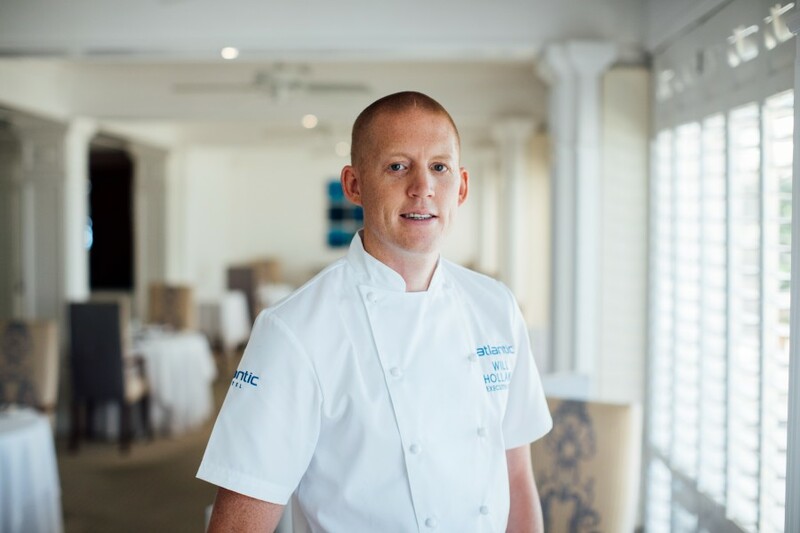 Chef Holland covers all the bases at Ocean. The Market Menu is excellent value, as is the a la carte with a choice of two or three courses. Then again, for anyone looking to get something more dramatic the Tasting Room awaits. 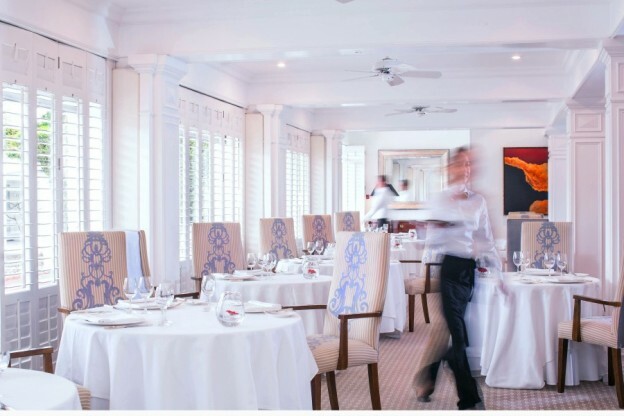 On such a small island with a stellar array of food options, Ocean Restaurant is right up there with Jersey’s best. 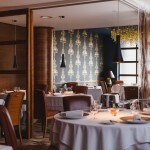 A La Carte menu: £50 for two courses, £65 for three courses.